I never ever, ever, ever thought I’d be sharing a post titled ‘Summer of Smoothies & Salads’ with you. But here we are. And I’m actually SO EXCITED to share this post with you. I could hardly wait to put it all together and hit publish. 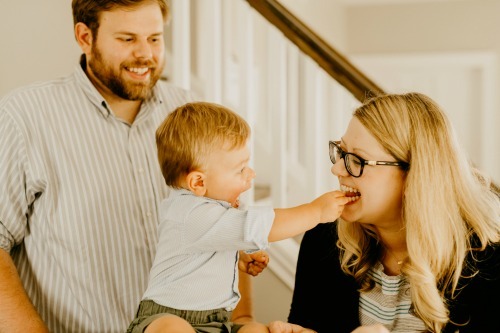 A few weeks ago, my husband Nick and I were talking about how we wanted to eat healthier. This is a recurring conversation. We’re always striving to be better, which I think is a good goal. Then life gets busy and nothing really changes in terms of eating healthier. I love rhymes and this sounded interesting. So I asked for more details. 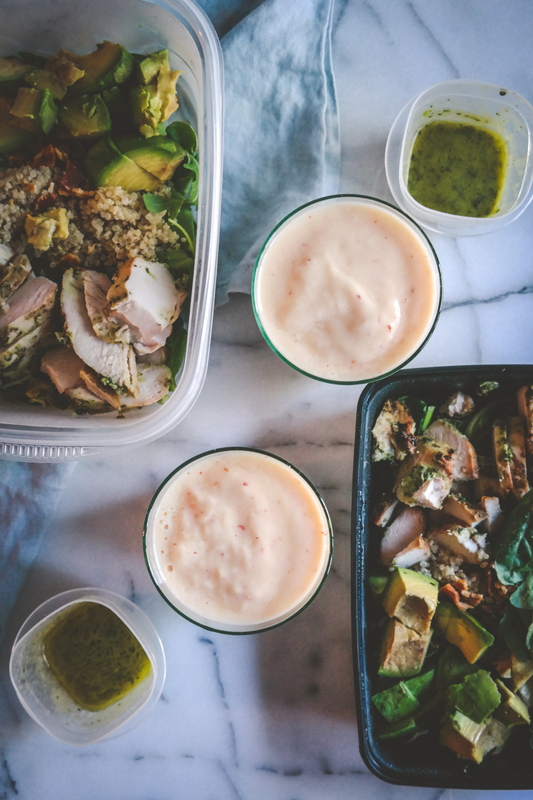 He elaborated that he thought we should do smoothies for breakfasts, and salads for lunch during the week. I LOVED the idea, and was so inspired by it that I actually did it, I got going, and now love it so much, that I can’t stop and thinking about it! I shared a few pictures on my Instagram stories, and was overwhelmed by the number of people asking for more information and shopping lists and recipes! So I put everything together and gah, I’m just so excited for this. The 1st day, I had the worst headache at noon after having just a fruit smoothie and salad. It made me think “oh my goodness, how bad was I eating that my body is reacting to fruits and veggies like this?” After week 1, I felt great. 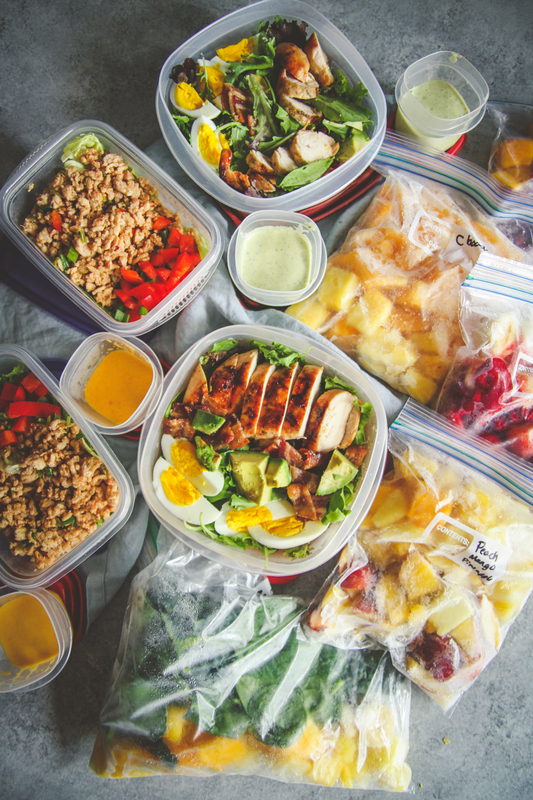 I’m not doing this to lose weight, I’m just doing this to get more fruits and veggies in my diet and be healthier (weight loss will be a nice added side effect? I haven’t weighed myself, but my husband lost 5 lbs the first week of us doing this). Use a good blender. I’ve heard good things about the Ninja blender ($89), years ago I got the Dash blender ($200) which I love and use (it’s on sale from $549, I got mine on sale and covet it as one of my best kitchen buys), and I’ve also heard good things about the Vitamix blender ($150-$350). I also use this single-serve blender ($17) when I’m making a smoothie for 1. In terms of liquid, you can use water, milk, non-dairy milk (like almond milk) and/or a combination of the options mentioned. 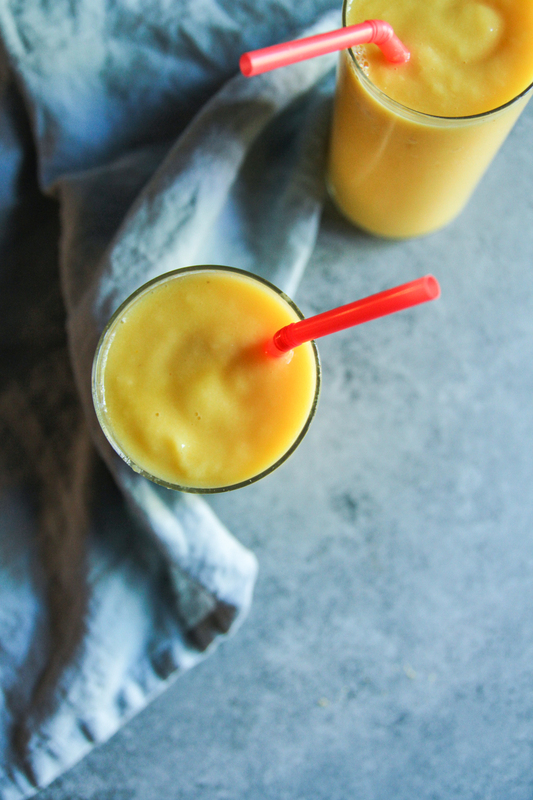 My favorite is a mixture of water and unsweetened almond milk – it gives it a creamy texture without too many extra calories. Buy frozen, pre cut fruit. It saves so much time. 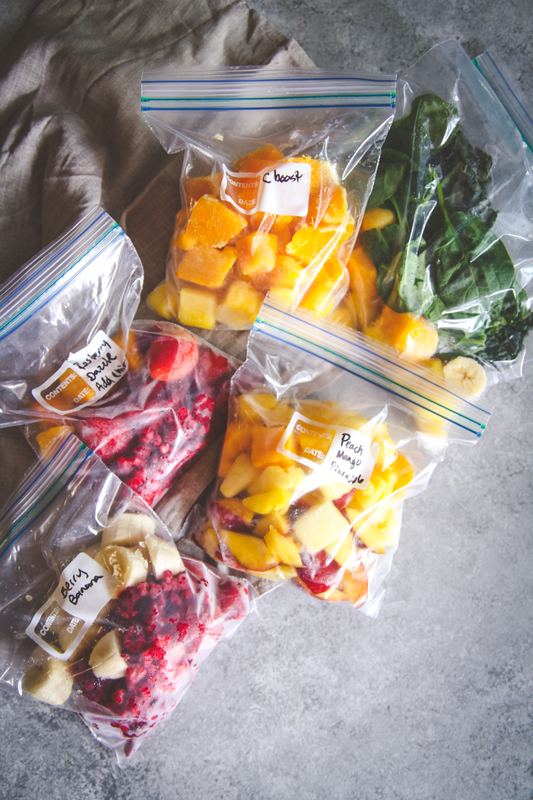 Make smoothie ‘bags’ containing all the fruit/vegetables, then in the morning all you have to do is dump the bag into the blender and add liquid. Pour in the liquid first, it helps get the smoothie blending. Use ice if using fresh fruits and vegetables. If you have leftover smoothie, pour it into an ice cube tray and then then add it as ‘ice cubes’ to your next smoothie. 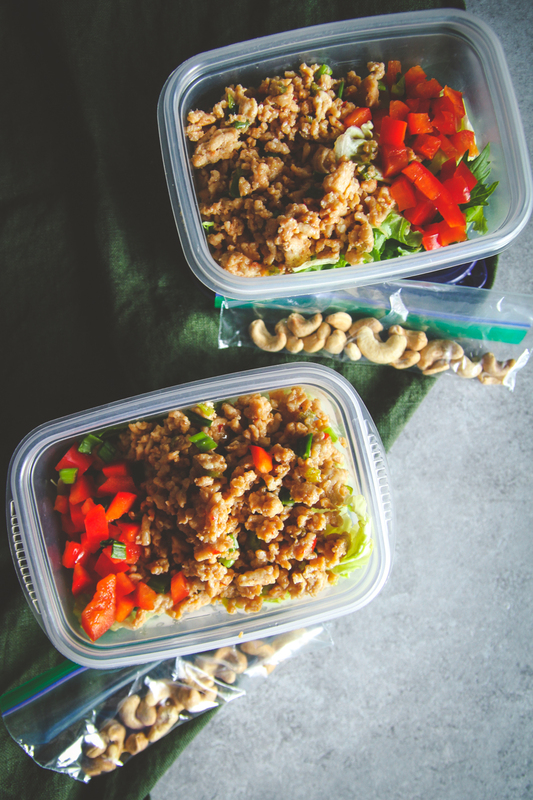 Always make sure your salad has enough protein (meat, nuts, eggs, quinoa). That makes all the difference for me. 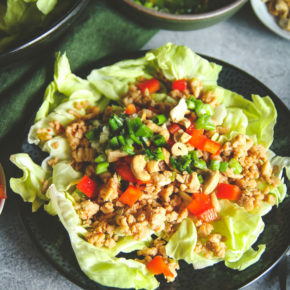 You want the crunch factor in salads, so make sure not to forget toppings like nuts, tortilla chips, or raw vegetables like bell peppers to give the contrast in texture. 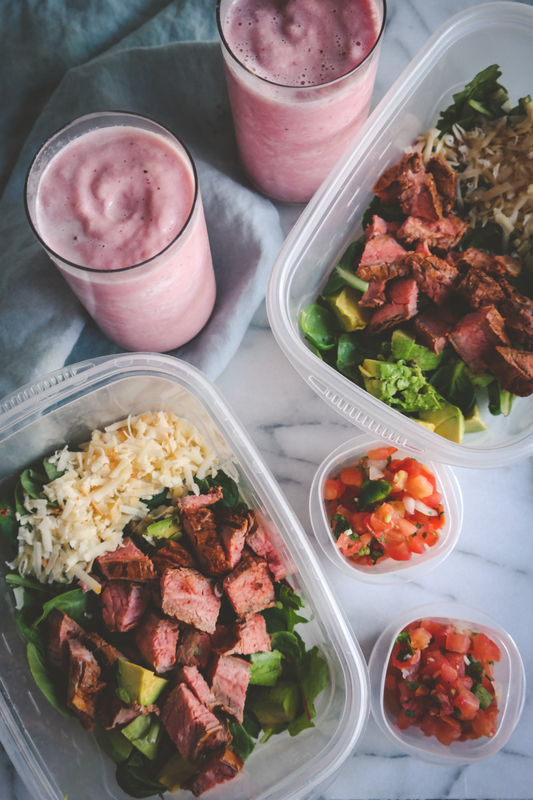 I make the smoothies ahead by putting all the fruit in a bag and putting the bag in the freezer, then in the morning I add the contents of the bag into a blender and add all the liquids. I cut strawberries by taking the top off and then cutting them in half. So 1 container of strawberries yielded about 3 cups. 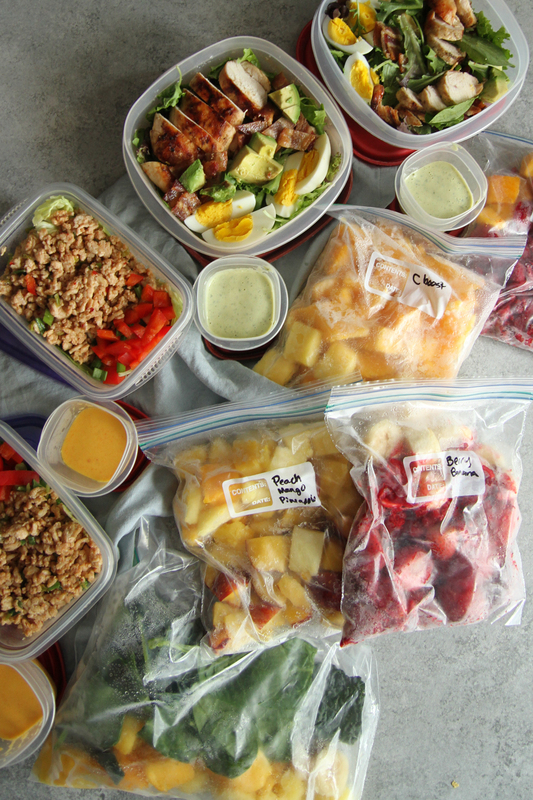 The recipes serve 2, and there are 5 recipes (Monday-Friday), we actually liked doing this so much we continued it into the weekends, but we’ll go to WholeFoods and get a smoothie on the weekends. 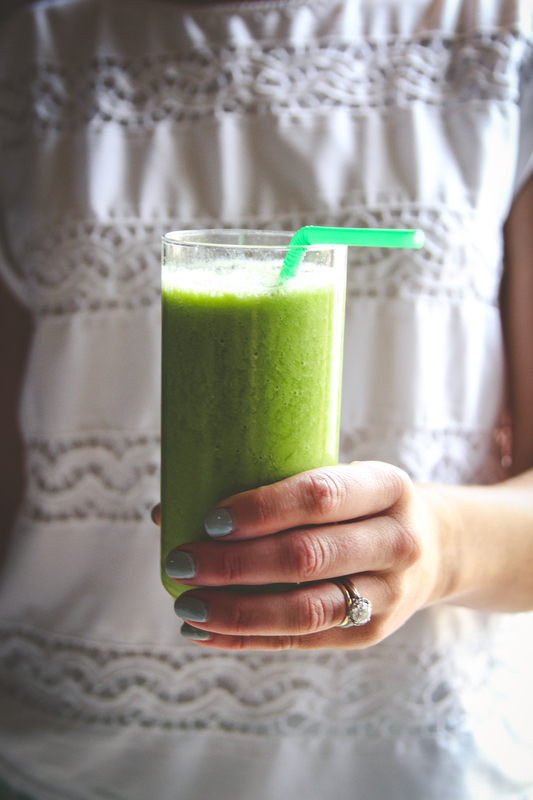 Smoothie 3: Green smoothie – 1 cup spinach, 1 cup mango, 1 cup pineapple, 1/2 banana, 1 cup milk of choice + 3/4 cup water (I will say that if you’re just getting started with green smoothies, I’d recommend only 1/2 a cup of spinach and a whole banana instead of 1/2 a banana). 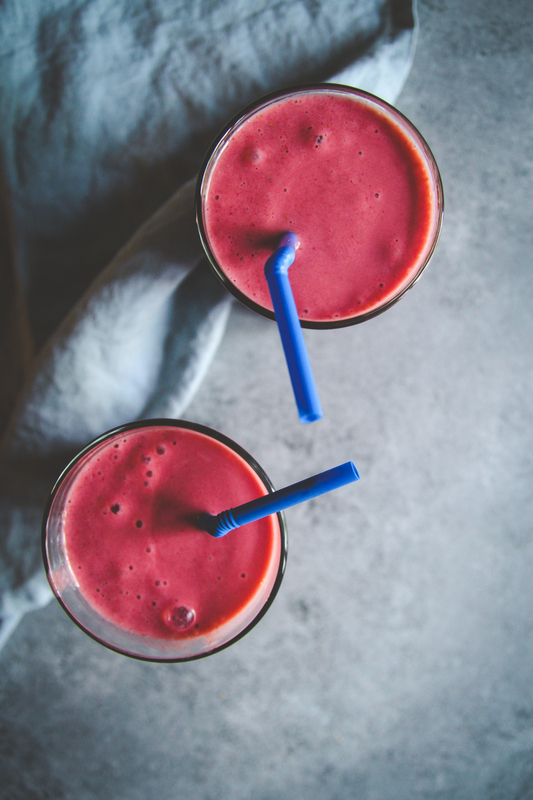 Smoothie 4: Nectarine smoothie – 2 nectarines, 1 cup pineapple, 1/2 banana, 1 small container greek yogurt with mixed berries, water (nectarines are a little tart, so you can use peaches instead). Smoothie 3: C boost smoothie (this one has become such a favorite you’ll be seeing it a lot in the coming weeks lol). 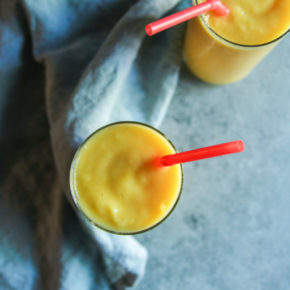 Smoothie 4: Vitamin C boost smoothie – I’m so in love with this smoothie, gah, actually all of the smoothie this week were so spot on! Salad 1: Grilled steak salad- each salad 4 oz grilled steak (grilled with salt/pepper/cumin/chili powder as seasonings and dabbed with olive oil), 2 cups spring mixed greens, 1/4 avocado, 5-10 tortilla chips, 1/2 oz shredded cheese, 1/4 cup store bought pico de gallo as salad dressing (next time I would add extra lime to the pico). Salad 5: Spinach salad with grilled chicken (chicken was marinated in a dash of olive oil, juice of 1 lemon, 2 garlic cloves, salt and pepper). I made 1/2 a batch of the salad recipe so we didn’t have any leftovers and I only used 1 apple instead of an apple and a pear. Salad 5: Grilled chicken Caesar. We just grilled chicken breasts brushed with a little olive oil and seasonings of choice and bought a Caesar salad kit, it was really nice to have a really easy salad with virtually no prep. 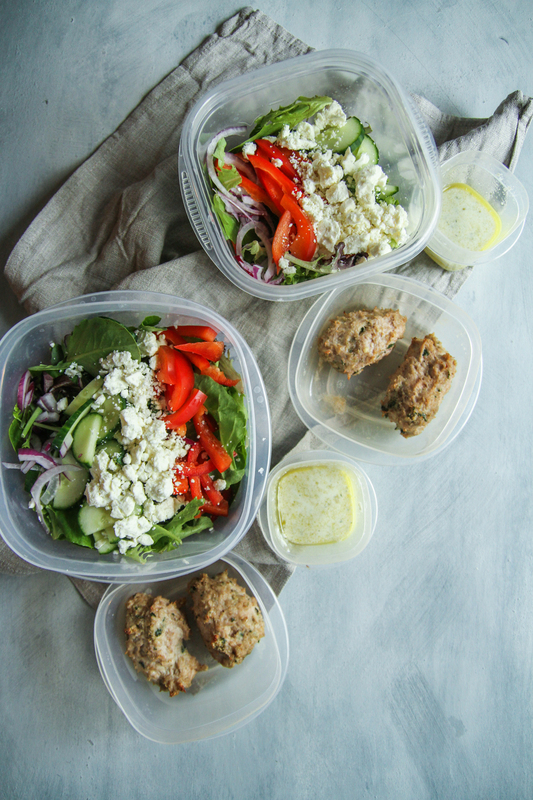 Salad 1: Greek salad with ground turkey kofta (you could use grilled chicken instead of the turkey kofta in this recipe). To make the ground turkey kofta – combine 1 lb ground turkey with 1/4 cup breadcrumbs, 1/4 cup Greek yogurt, handful of fresh parsley chopped (or 1 tbs dried parsley), 1 teaspoon oregano and 1/2 teaspoon salt. Stir and then form into oblong meatball shapes. Bake at 375 for 20 minutes on a foil lined baking sheet. For the salad dressing I combined 1/4 cup Greek yogurt, 1/4 cup olive oil, 1/2 teaspoon oregano, juice of 2 lemons and a pinch of salt, then divided it into 4 containers. For the salad, per salad: 2 cups mixed greens, 1-2 tablespoons of finely chopped red onions, 1/4 red pepper chopped, 1/4 cup cucumber slices, 1-2 tablespoons crumbled feta cheese, 1/4 of the turkey koftas you made earlier and 1/4 of the dressing. Salad 2: Repeat of above. This was by far one of my all time favorite salads we’ve had! Salad 3: Protein egg and quinoa salad (I shared this and it’s on my Instagram stories highlight!). 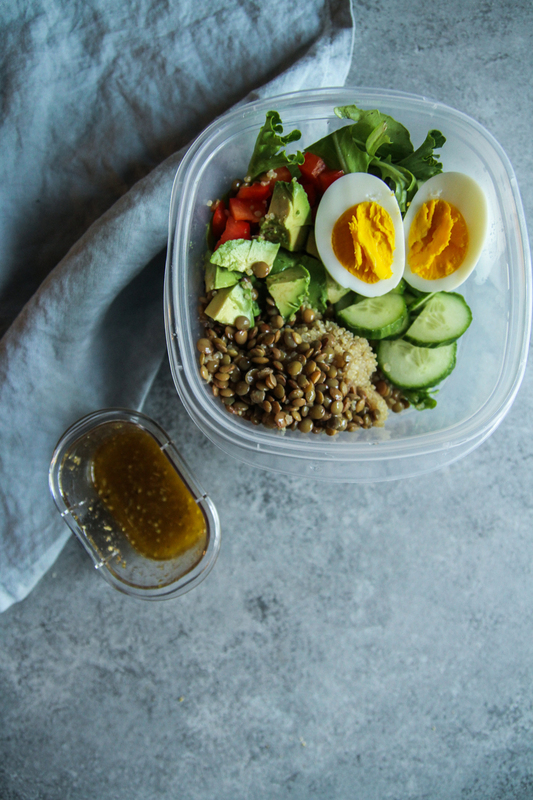 The recipe per salad is: 2 hard boiled eggs, 1/4 cup cooked lentils, 1/4 cup cooked quinoa, 1/4 bell pepper chopped, 1/4 of a cucumber chopped, 2 cups greens. Dressing per salad is 1 tablespoon olive oil 1 lime juice, 1 teaspoon red wine vinegar and a dash of dried oregano and salt. I used this recipe from Skinnytaste as inspiration. Salad 4: Apple feta pecan salad with grilled chicken. For each salad: 2 cups greens, 1/4 granny smith apple finely sliced, 2 tablespoons candied pecans (they usually sell them pre made in the cheese section of the grocery store), 1-2 tablespoons crumbled feta cheese, 1 grilled chicken breast (we grilled the chicken brushed with olive oil and a dash of salt and pepper, or you could use rotisserie chicken) and for the dressing a mixture (I made the dressing and divided it into 4 small containers) of 1 teaspoon Dijon mustard, juice of 1 small orange, 1 tablespoons white wine vinegar, 3 tablespoons extra virgin olive oil, 1 teaspoon honey, pinch of salt and pepper. I used this recipe from A Beautiful Plate for inspiration. Salad 4: Greek salad with ground chicken kofta (you could use grilled chicken breasts or ground turkey like i used last week, instead of the ground chicken kofta in this recipe). To make the ground chicken kofta – combine 1 lb ground chicken with 1/4 cup breadcrumbs, 1/4 cup Greek yogurt, handful of fresh parsley chopped (or 1 tbs dried parsley), 1 teaspoon oregano and 1/2 teaspoon salt. Stir and then form into oblong meatball shapes. Bake at 375 for 20 minutes on a foil lined baking sheet. For the salad dressing I combined 1/4 cup Greek yogurt, 1/4 cup olive oil, 1/2 teaspoon oregano, juice of 2 lemons and a pinch of salt, then divided it into 4 containers. For the salad, per salad: 2 cups mixed greens, 1-2 tablespoons of finely chopped red onions, 1/4 red pepper chopped, 1/4 cup cucumber slices, 1-2 tablespoons crumbled feta cheese, 1/4 of the chicken koftas you made earlier and 1/4 of the dressing. Salad 5: Repeat of above. 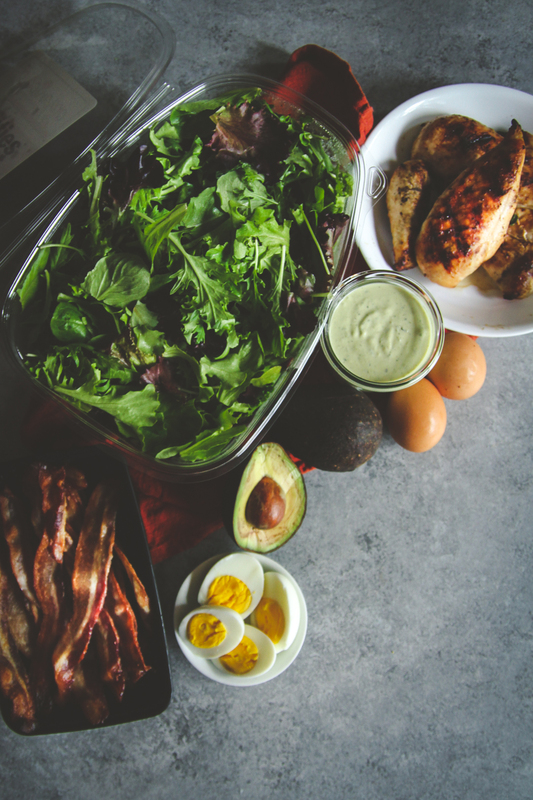 This was by far one of my all time favorite salads we had – it was an exact replica of the salad from week 3 and we loved it! There you have it!! 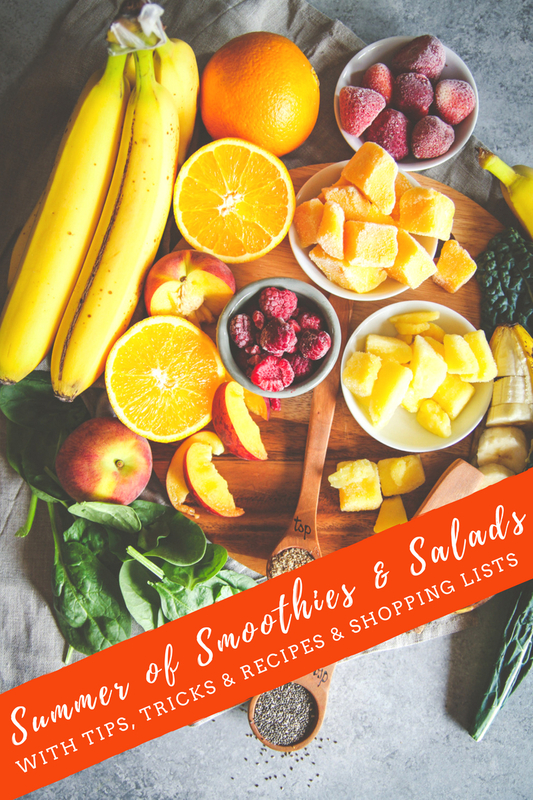 4 weeks of smoothies and salads with shopping lists. I’d love to know in the comments section, have you made any/all of these recipes? Shopping lists: To get the shopping lists, simply enter your name and email below the image on the week you’d like! You’ll be redirected to the pdf of the shopping list, as well as it will be emailed to you. Success! Now check your email to confirm your subscription and download your shopping list! I’ll keep updating this post as we go along, so be sure to bookmark it! 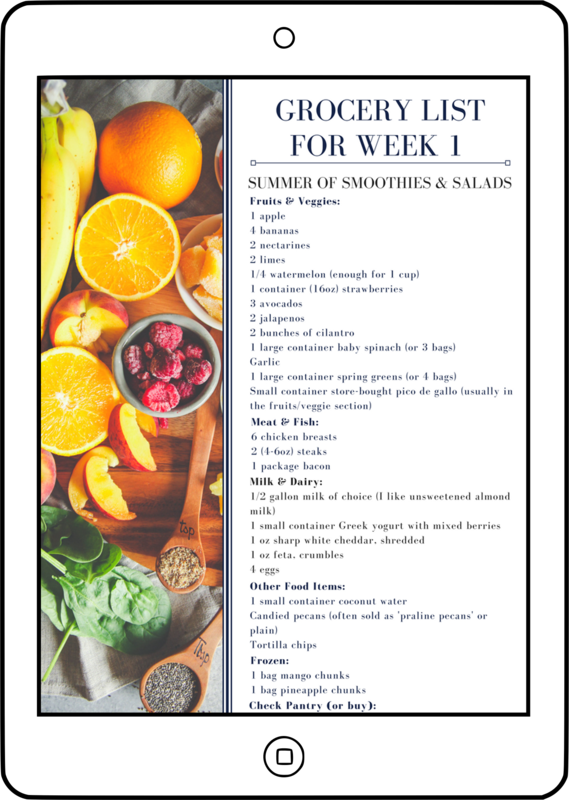 If you’d like to join me on this Summer of Smoothie and Salads challenge I’d LOVE to see what you’re making. 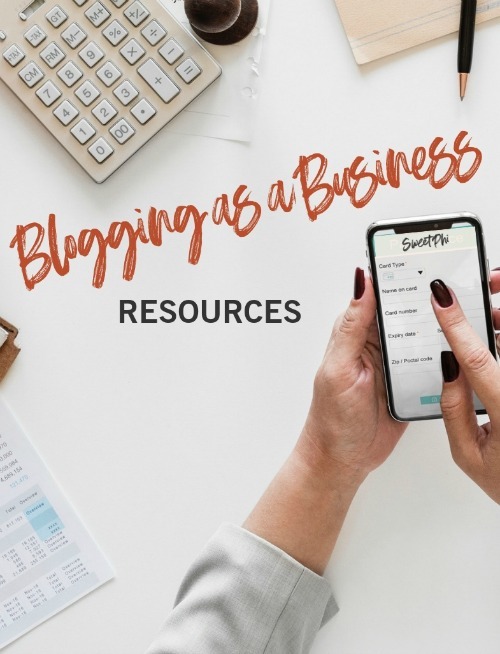 Just tag #sweetphiblog on Instagram! 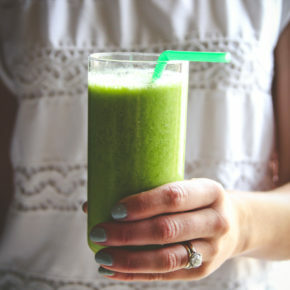 Green Smoothie Recipe...that actually tastes good! Fantastic blog!!!!!! Very helpful to eating healthier!!!! Thank you so much. 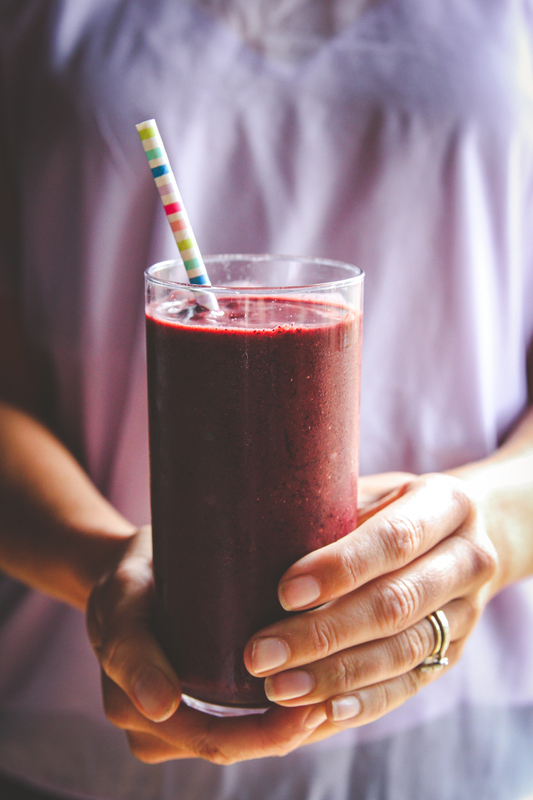 Do you know the calorie contact of each smoothie? Thank you so much Phyllis, really appreciate your comment, so happy to hear you like my site! 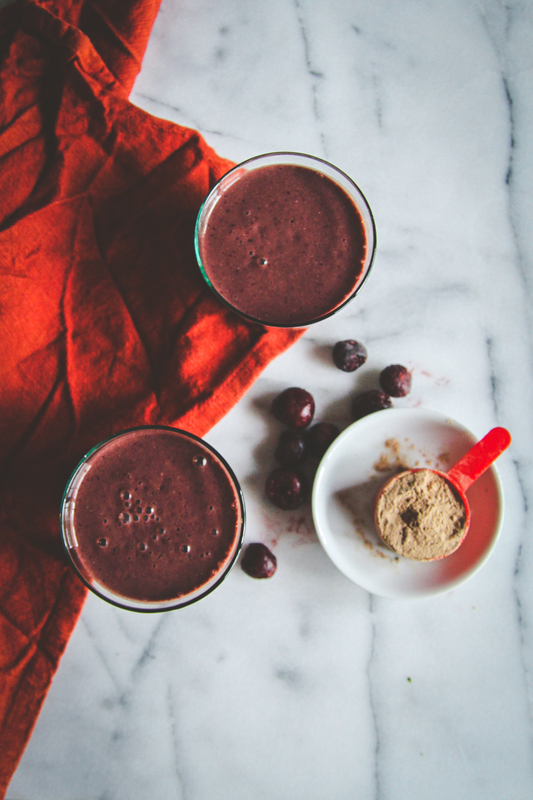 Each smoothie is between 250-350 calories, give or take a little depending on the ingredients. Is there a coconut water you prefer? There are a zillion choices so was hoping to narrow down the choices a bit lol! I use Vita Coco brand 🙂 I totally know what you mean though, there are SO many different ones out there.